A. No, while it will save you time when placing future orders, an account isn’t necessary. Simply select “direct checkout” after checking you’re happy with what’s in your basket and you’ll be taken straight to the payment screen. Please note that selecting this option means you won’t be able to review your order or add multiple delivery addresses. Q. How can I change my personal information? A. Simply login to your account and then click on your account dashboard to edit your personal information. A. Click on “Create an account” on the upper right side of the homepage and fill in your details. Q. I forgot my login or my password. How can I get them back? A. On the login screen click on the link “password forgotten” and enter the email address you provided when registering. A new password will then be sent to this email address. Q. If I register an account is my information kept confidential? Or will you pass on my details on to any other companies? A. The information you provide is simply so we can complete your order and to notify you of future promotions and special offers. We hate spam as much as you do and will not pass your details on to any other companies. Q. How do I know your website is secure and my information is safe? A. All of the information you enter is protected using high-level SSL encryption technology. This is the most advanced security software available for online transactions and is the same system used by payment processing companies and online banks. Q. Your huge range of Japanese and Chinese tea sounds fantastic. How do I place an order? A. We’ve designed the WellTea website to be as easy to use as possible. Simply click on the ‘Add to shopping basket’ icon next to the tea you would like to buy. It will then be added to your shopping basket. When you’re ready to complete your order simply click on the ‘Checkout’ button and confirm your account or payment information. Q. Can I send your tea as a gift? A. As lovers of tea ourselves, we think that an authentic packet of Japanese or Chinese tea makes the perfect gift. So we’ve made it easy for you to send your order to an alternative address. Before completing your order you will be asked if you want the order to be shipped to your billing address. Select the option to choose a new delivery address and enter the address of the person you’d like to send the tea to along with a message informing them why they’ve received such a special present. Q. Does your tea have an expiration date? A. Like a fine wine, our tea doesn’t have an expiration date, although we do put lot numbers on our tea to identify when the tea was produced. While our tea can be stored for a long time, we recommend brewing it within two years while it still retains the best taste and aroma. Q. How can I change my delivery address? A. You can either change your delivery address within your account’s address book. You can store several addresses at once. Or you can change it during the checkout stage by selecting ‘ship to a different address’. Q. My order hasn’t arrived yet. Has the parcel been lost? A. When your order is shipped we will send you a confirmation e-mail to let you know it’s on its way. You can then track it’s progress all the way to your front door by logging into your account then opening up the order information and clicking on “track your order”. Q. I entered the wrong address when placing my order. What should I do? A. If you made a mistake when placing your order then please contact us as soon as possible (contact@welltea.com). Our customer service team will then try to update your order details. However, if your order has already been shipped then we will no longer be able to change where it is delivered to. Q. How quickly will my tea be delivered? A. Orders within the UK are prepared and shipped within two working days. Please check our ‘Shipping Information’ page for delivery times to countries in Europe. A. You can pay for your order using a credit card (Visa or Mastercard) or with PayPal. We also accept payments by wire transfer. If you want to pay by wire transfer, please contact customer services by email (contact@welltea.co.uk). They will then send you our bank details for completing the payment. Your order will be shipped as soon as payment is received. Q. How can I use coupons when placing an order? A. To use a coupon simply enter the coupon code during the checkout process. Please note that only one coupon can be used per order. Q. What happens if my credit card payment is refused? A. If a payment fails then it’s because your bank won’t authorize it. If this happens, we suggest contacting your bank to find out why. Q. Is the shipping cost refunded if I return my order? A. We are unable to refund the shipping costs unless the tea you receive is incorrect or the bag containing the tea has been damaged during transportation. Q. How will my refund be processed? A. We will refund your order using the same method you used when purchasing, so it will be either directly to your bank account if you paid by credit card) or to your PayPal account. Remember, WellTea uses a secure payment system (SSL) so whenever making a refund your personal information will be completely safe. Q. Is it possible to exchange the tea I bought for another type? A Once you’ve completed a purchase we don’t offer exchanges for other types of tea. If you’re unhappy with your purchase, please return it to us for a refund. Please note that only the produce itself will be refunded and not the postage costs. Q. I’ve received the wrong type of tea? What should I do? A. If you receive the wrong type of tea, please contact our customer service team as quickly as possible. We will then arrange for the tea to be replaced with the correct type. If the type of tea is out of stock then we will notify you by email. Q. What is the turnaround time for a returned order? A. As soon as we receive your returned tea we will refund your bank account or Paypal account. A replacement will then reach you within 10 working days. Q. What is the best way to store loose leaf teas? A. Our tea needs to be carefully stored to protect its flavour. Ideally it should be stored in an air tight container to protect it from moisture and oxygen, which will dilute its aroma and taste. The container should be kept in a cool place away from direct sunlight, but not in the refrigerator or freezer. The strong smells and moisture will reduce the potency of the delicate leaves. Q. 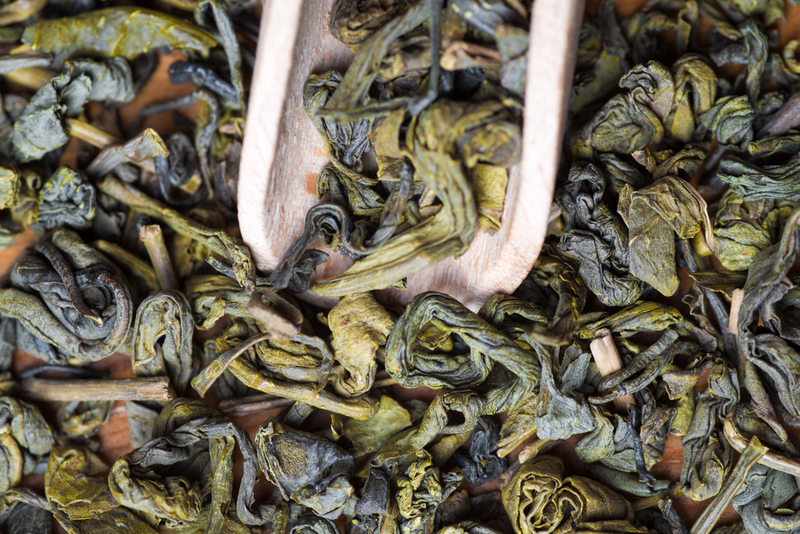 How much caffeine is in green tea? A. There are many factors that can affect the amount of caffeine in tea. This includes the variety of tea itself, how much is added to a cup or tea pot and the length of time it is brewed. As a yardstick figure, a cup of green tea has two thirds less caffeine than a typical cup of coffee. Q. What are the benefits of your tea bags over normal bags? A. Our pyramid-shaped tea bags have been specially designed to allow the tea leaves to fully expand when they are placed in hot water. This enables them to full release their aroma and taste. Made from a silky type of nylon, our teabags are food safe, hygienic and will remain held together even in boiling water. Q. What is the difference between decaffeinated and herbal tea? Aren’t they the same? A. As the name suggests, decaffeinated tea has had the caffeine removed. Herbal tea, however, is made from natural herbs rather than tea leaves. So whilst not technically tea, it is still brewed in the same way not really tea at all, but is herbs brewed in the same way that tea is brewed. Herbals are sometimes referred to as tisanes and never had any caffeine to begin with.